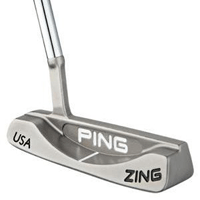 The Ping B60 is one of the classic shapes of the the last 50 years in putting. Used by Nick Faldo for two of his major victories in Beryllium Copper form, it has been manufactured by Ping in many different materials over the years. The shape of the two bulges at back of the putter is what gives it its "B" name, and you should be aware that optical research has proven that rounded shapes are more difficult to align than straight, perpendicular ones, but the long aimline on the B60 does go some way to make up for this. For me the overwhelming feeling of the B60 is that of a ringing sound when you make contact with the ball. It's not in the same "pinging" league as some of the older Anser models whose "soundslot" make them really sing. The sound here more that of a muted bell. But there's no delicate feel from the B60, along with this distinctive sound, which is a bit of a disappointment. This is compounded by the fact that the putter head isn't as dainty as many thinner styles of putter. The ball comes off the face slowly with a fairly dull thud and this is a characteristic that you'll like if you regularly putt on superfast greens, but may otherwise disappoint you. Nevertheless this almost unique delivery of the ball from the clubface probably accounts for why Nick Faldo used this putter to such good effect at the end of his career on the slick greens of Augusta National. Although it has an attractive appearance and great roll, the B60 has been the lesser relation to the Anser in Ping's stable for several decades, and for my money I wouldn't opt for a B60 because of the dull feel. The feel may well leave you unimpressed as well, but it is a great putter for slippery putts on fast greens and this alone will keep golfers buying and using the Ping B60 for many years to come.